Your fireplace screen should be effective at protecting your home from sparks but that doesn't mean it can't be decorative as well. 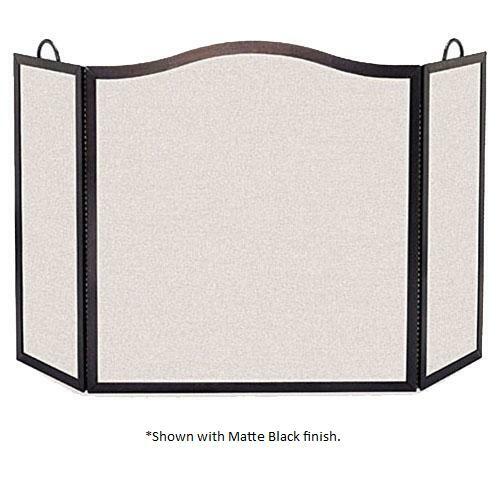 This three-panel screen has a simple, unadorned design, but it has an elegant camel arch on the center panel. The frame is made of durable steel with an attractive vintage iron finish. Handles on each of the side panels allow you to lift and move the screen easily when fireplace tasks are necessary. The panels are joined by sturdy piano hinges for years of dependable service. The dimensions of the center panel are 30" W x 32.5" H and the two side panels are each 8" W x 30" H.